Elmer Ambrose Sperry, Sr. (October 12, 1860 – June 16, 1930) was an American inventor and entrepreneur, most famous as co-inventor, with Herman Anschütz-Kaempfe of the gyrocompass and as founder of the Sperry Gyroscope Company. His compasses and stabilizers were adopted by the United States Navy and used in both world wars. He also worked closely with Japanese companies and the Japanese government and was honored after his death with a biography in his honor. Sperry was born at Cincinnatus, New York on October 12, 1860 to Stephen Decatur Sperry and Mary Burst. He was of English ancestry. His family had been in what is now the Northeastern United States since the 1600s, and his earliest American ancestor was an English colonist named Richard Sperry. His mother died the next day, from complications from his birth. He spent three years at the State Normal School in Cortland, New York, then a year at Cornell University in 1878 and 1879, where he became interested in dynamos . He moved to Chicago, Illinois, early in 1880 and soon after founded the Sperry Electric Company. He married Zula Augusta Goodman (1860-1929) in Chicago, Illinois on June 28, 1887. In 1887, Sperry created a system to bring electricity into coal mines, heating the copper wires to prevent corrosion. This system allowed him to bring self-designed mining equipment deep below the surface to greatly increase the production of coal, and in 1888 the Sperry Electric Machinery Mining Company was founded. In 1890, Sperry formed the Sperry Electric Railway Company. Here he used ideas from his electric trains sold by his mining company to create electric trolleys in large, hilly cities in Ohio and Pennsylvania. While working with this company, Sperry designed an electric automobile, which lead to Sperry patenting ideas that would be later used in the development of portable lead acid batteries. In 1896, he drove his car in Paris, making it the first American-made car in Paris. In 1894, General Electric bought the railway company and its associated patents. In 1900 Sperry established an electrochemical laboratory at Washington, D.C., where he and his associate, Clifton P. Townshend, developed a process for making pure caustic soda and discovered a process for recovering tin from scrap metal. After experiencing seasickness on a Atlantic voyage in 1898, Sperry started to work on incorporating a large gyroscope into a ship to lessen the effect of waves on the ship. His gyroscope stabilized ship differed from others at the time by having a sensor built in to the system to detect the first signs of a wave that the system would have to work to mitigate. 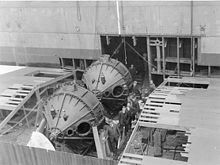 And in 1911, Sperry worked with the US Navy to incorporate his gyroscopic stabilizer which greatly reduced major roll of the ship. While effective, Sperry's gyrostablizer proved to never hit a mass market because of its expense, both in installation and in maintenance cost. Sperry found another use for his gyroscopes in 1908. Magnetic compasses on steel battleships at the time had issues with maintaining magnetic north with the variations of the magnetic field they experienced. Working with Hannibal C. Ford, Sperry began work on a gyrocompass to replace the magnetic compass. In 1910 he founded the Sperry Gyroscope Company in Brooklyn, New York on the basis of this innovation. His first navigational gyroscope was tested that same year in USS Delaware (BB-28). After successful tests, Sperry's gyrocompass was soon being installed on American, British, French, Italian, and Russian naval crafts. During World War I, the importance of the gyrocompass increased as the compass was adapted to control the steering of a ship to automatically hold a steady line. During both world wars, Sperry's company profited from military demand for gyroscopes. During World War I Elmer worked to create a "flying bomb", and on March 6,1918 he guided an aerial torpedo over half a mile using radio control. His technology was used in torpedoes, ships, airplanes, and spacecraft. Sperry moved into related devices such as bombsights, fire control, radar, and automated take off and landing. In 1914 he won a prize from the Aero Club of France for his airplane stabilizer. He also was awarded a Franklin Institute Medal in the same year. Starting in 1914, Sperry began working with the US Navy to develop higher power lighting for use with naval turrets. Out of this partnership, Sperry and his team at the time created a new kind of arc lamp that heated a gas to incandescence, creating a source of light five times brighter than other continuous light sources of the time. In 1918 he produced a high-intensity arc lamp which was used as a searchlight by both the Army and Navy after setting up eight companies. In 1923, his son, Lawrence Burst Sperry (1892–1923), died in the English Channel in the crash of an airplane of his own design. In January 1929 he sold his Sperry Gyroscope Company to North American Aviation. The following year his wife died on March 31, in Havana, Cuba. He died at St. John Hospital in Brooklyn, New York on June 16, 1930 from complications following the removal of gallstones six weeks earlier. He was 69 years old. Two decorations from the last Czar of Russia; two decorations from the Emperor of Japan, the Order of the Rising Sun and the Order of the Sacred Treasure; and the grand prize of the Panama Exposition. Sperry Rail Service (1911) a rail defect detection company. Sperry was also a founding member of the US Naval Consulting Board, 1915. In 1916, Sperry joined Peter Hewitt to develop the Hewitt-Sperry Automatic Airplane, one of the first successful precursors of the UAV. ^ a b c d e f g h i j "Elmer Sperry Dies. Famous Inventor". The New York Times. June 17, 1930. Retrieved 2012-12-21. Elmer A. Sperry, inventor, died yesterday morning at St. John's Hospital, Brooklyn, from complications which set in after he had recovered from an operation for gallstones six weeks ago. He was in his seventieth year. ^ Durgin, Russell and Kawaguchi, Zenichi, "Dr. Sperry As We Knew Him," (1931, Nichi-Bei Press). This volume of reminiscences by the Japanese engineers and diplomats who knew him was published in a bilingual text. ^ a b c d e f g h i j k l m n o p q r National Academy Biographical Memoirs - Vol. XXVIII. National Academies Press. 1954. pp. 223–260. ^ "Elmer Sperry Dies; Famous Inventor". www.nytimes.com. Retrieved 28 October 2018. ^ a b c Brown, David E. (2003). Inventing modern America : from the microwave to the mouse. B MIT Press. ISBN 0262523493. OCLC 746926958. ^ Benson, Alvin K. (2010). Great lives from history. Inventors & inventions. Pasadena, Calif.: Salem Press. ISBN 9781587655296. OCLC 496519422. ^ "Who Made America? – Innovators – Elmer Sperry". www.pbs.org. Retrieved 28 October 2018. ^ "Institute and Related Activities" (PDF). Journal of the American Institute of Electrical Engineers. XLII: 1369. Dec 1923. ^ http://www.nasonline.org, National Academy of Sciences -. "Elmer Sperry". www.nasonline.org. Retrieved 28 October 2018. ^ "Elmer Ambrose Sperry". The Franklin Institute. 2014-01-11. Retrieved 2019-03-17. ^ a b "Collier 1911-1919 Recipients - NAA: National Aeronautic Association". naa.aero. Retrieved 2019-03-17. ^ "Holley Medal". The American Society of Mechanical Engineers. Retrieved 17 March 2019. ^ "John Fritz Medal Past Recipients". American Association of Engineering Societies. 2015-03-29. Retrieved 2019-03-17. ^ "Elmer A. Sperry". The Franklin Institute. 2014-01-11. Retrieved 2019-03-17. ^ Times, Special to The New York (1915-09-13). "DANIELS NAMES NAVAL ADVISORS; Announces Makeup of Board of Inventors Headed by Thomas A. Edison. COOPER HEWITT A MEMBER Hudson Maxim, Henry A. Wise Wood, Alfred Craven, and F.J. Sprague Other New Yorkers. NOTED ENGINEERS TO SERVE Chemists, Aeronautical Experts, Inventors, and Authorities on Explosives Also Picked. DANIELS NAMES NAVAL ADVISORS". The New York Times. ISSN 0362-4331. Retrieved 2019-04-13. Thomas P. Hughes, Elmer Sperry: Inventor and Engineer (Baltimore: Johns Hopkins University Press, 1971). Finding aids for the Elmer Ambrose Sperry papers and the Elmer Sperry photograph collection are available at Hagley Museum and Library. This page was last edited on 19 April 2019, at 22:21 (UTC).